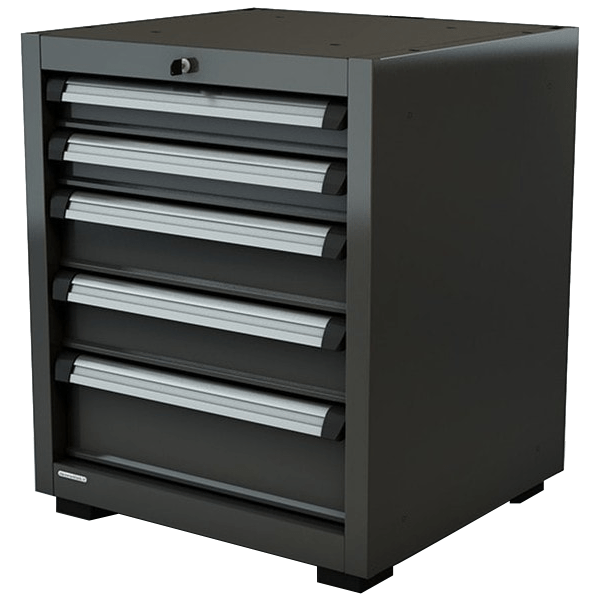 Fixed drawer unit with 7 fully-extending drawers mounted on guides DEAmotion (soft closing). Each drawer can sustain up to 30 Kg while fully open. The cabinet is equipped with a key-operated lock for closing all the drawers, an ergonomic handle in extruded aluminium with guides for inserting labels, and adjustable feet for properly leveling the module itself. All the components are epoxy powder coated. There are pre-cuts in the upper and rear zones of the structure that can be easily opened during the installation phase in order to feed electrical wires or air hoses into the sides of the cabinet. DEAmotion guides with soft closing to facilitate and expedite user’s work activities. Possibility to feed electrical cables and air hoses for connecting to local systems. Ergonomic handle in chrome-plated and polished extruded aluminium. 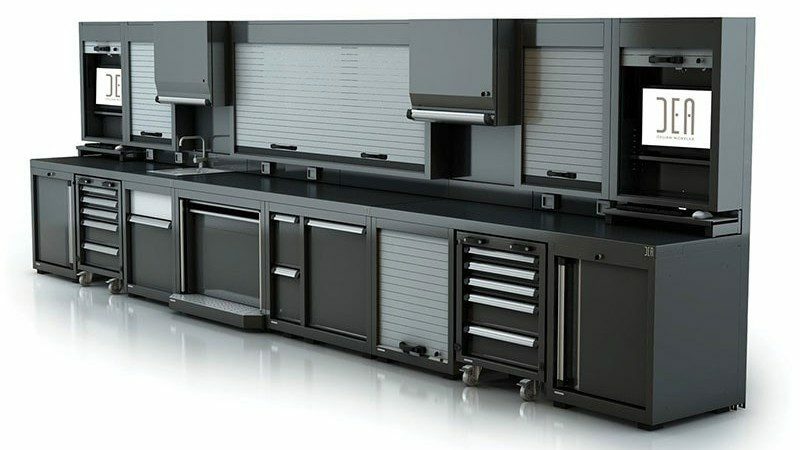 A fixed drawer unit with 5 fully-extending drawers mounted on DEAmotion guides (soft closing). Each drawer can sustain up to 30 Kg while fully open. The cabinet is equipped with a key-operated lock for closing all the drawers, an ergonomic handle in extruded aluminium with guides for inserting labels, and adjustable feet for properly leveling the module itself. All the components are epoxy powder coated. There are pre-cuts in the upper and rear zones of the structure that can be easily opened during the installation phase in order to feed electrical wires or air hoses into the sides of the cabinet. 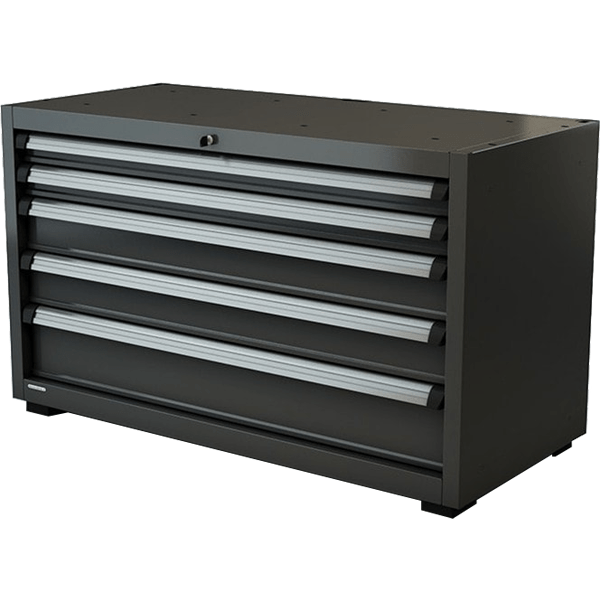 A fixed drawer unit with 5 fully-extending drawers mounted on reinforced HD guides. Each drawer can sustain up to 100 Kg while fully open. The cabinet is equipped with a key-operated lock for closing all the drawers, an ergonomic handle in extruded aluminium with guides for inserting labels, and adjustable feet for properly leveling the module itself. All the components are epoxy powder coated. 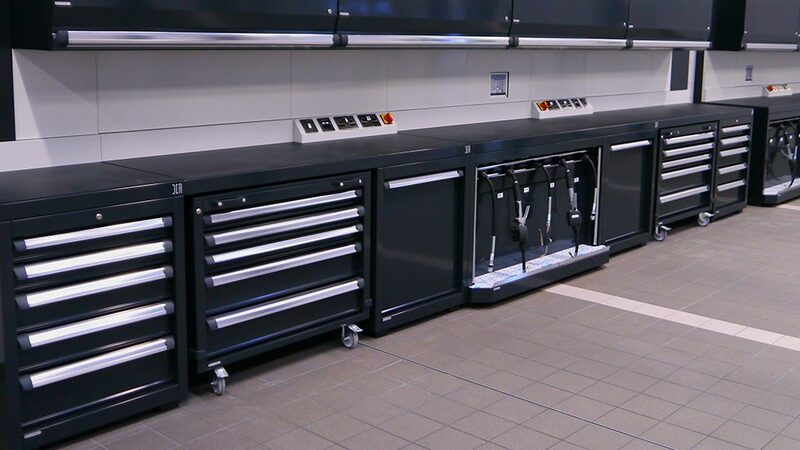 Furthermore, there are pre-cuts in the upper and rear zones that can be easily opened during the installation phase in order to feed electrical wires or air hoses into the sides of the cabinet. 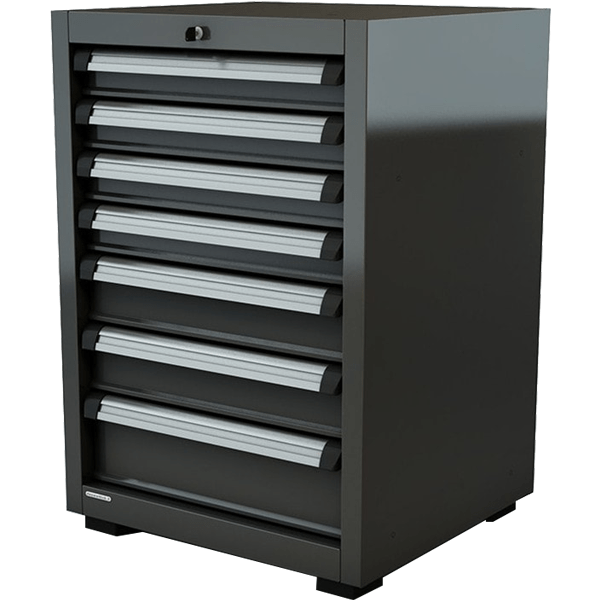 Drawers with a capacity of up to 100 kg. A fixed drawer unit with 6 fully-extending drawers mounted on reinforced HD guides. Each drawer can sustain up to 100 Kg while fully open. The cabinet is equipped with a key-operated lock for closing all the drawers, an ergonomic handle in extruded aluminium with guides for inserting labels, and adjustable feet for properly leveling the module itself. All the components are epoxy powder coated. 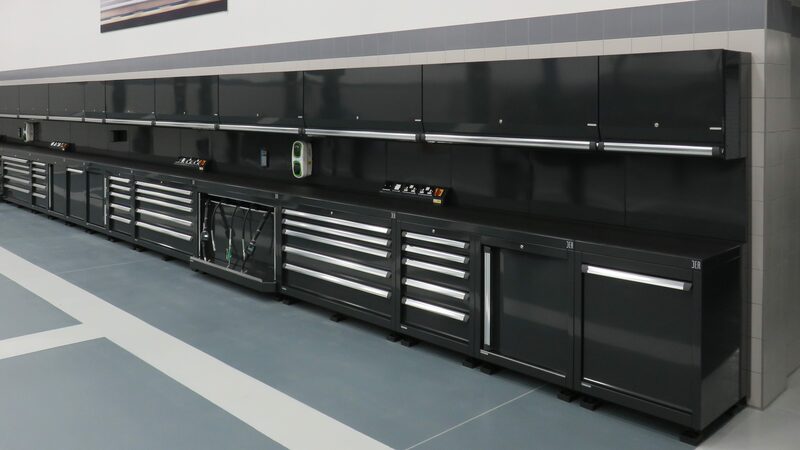 Furthermore, there are pre-cuts in the upper and rear zones that can be easily opened during the installation phase in order to feed electrical wires or air hoses into the sides of the cabinet. 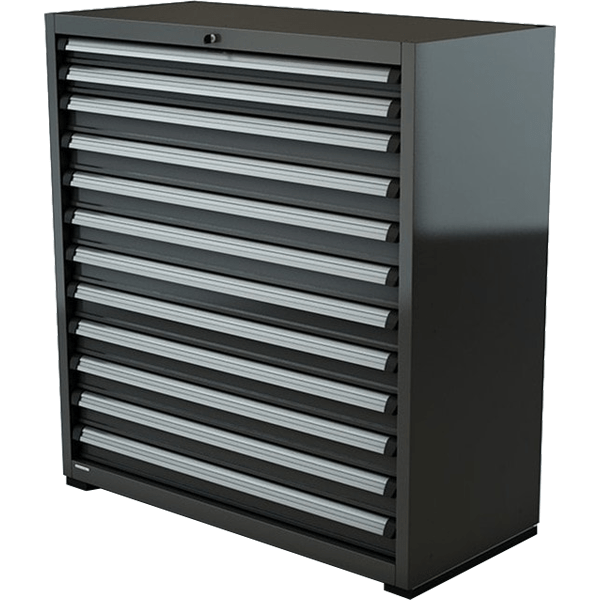 A fixed drawer unit with 12 fully-extending drawers mounted on reinforced HD guides. Each drawer can sustain up to 100 Kg while fully open. The cabinet is equipped with a key-operated lock for closing all the drawers, an ergonomic handle in extruded aluminium with guides for inserting labels, and REINFORCED adjustable feet for properly leveling the module itself (the entire module can sustain a weight of up to 1200 kg). All the components are epoxy powder coated. 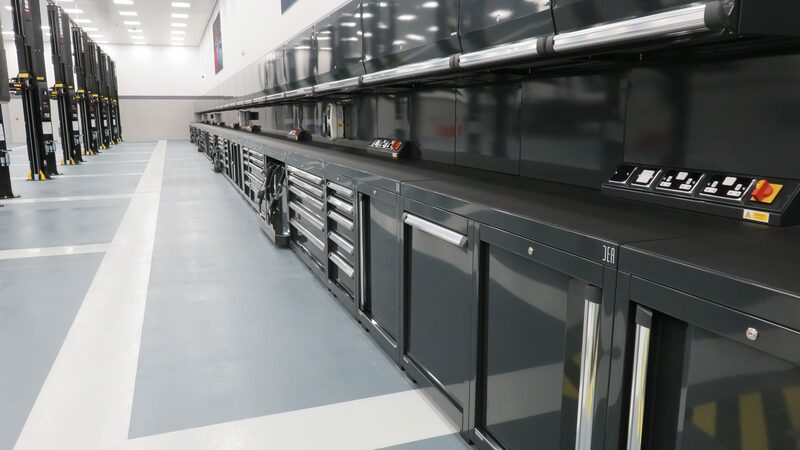 Furthermore, there are pre-cuts in the upper and rear zones that can be easily opened during the installation phase in order to feed electrical wires or air hoses into the sides of the cabinet. Load bearing capacity of up to 1200 kg.